The LT3 is an advanced liquid helium flow cryostat utilizing many unique features, such as the matrix heat exchanger and the co-axial shield flow transfer line, to achieve unparalleled efficiency and vibration levels. 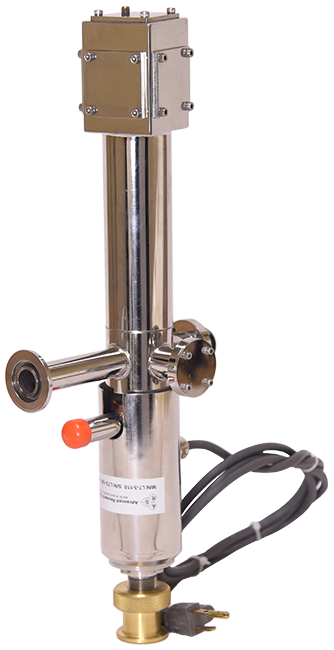 The LT3 cryocoolers are typically equipped with a stainless steel instrumentation skirt, with our unique double o-ring design that allows for easy attachment, alignment, and removal of the vacuum shroud. For goniometer users, the LT3K was designed to integrate with the Newport Kappa Goniometer and the LT3G was designed to fit into the Huber 5012.12 cryostat mount. The small radial clearance of the LT3G also makes it ideal for many other manipulator applications. The ARS manufactured LT3B is a true UHV cold head (10-11 Torr) where all of the rubber o-ring seals have been replaced with welded joints and metal seals. For UHV surface science where very long cold fingers are required, we have the LT3M with customizable length up to 1200 mm and rigid support tube to allow for cleaving and manipulation.